The Tennessee nursery transported eastern hemlock seedlings infested with hemlock woolly adelgid (HWA), a prohibited invasive species, to Oswego and Schenectady counties. Under the terms of the order, the nursery is required to provide DEC with monthly nursery stock orders for New York State through 2020 in order to continue doing business in New York State. Invasive species are non-native plants, animals, and diseases that harm or can cause harm to the environment, the economy, and human health. New York’s Part 575 Invasive Species Regulation, adopted in July 2014, prohibits or regulates the possession, transport, importation, sale, purchase, and introduction of select invasive species. 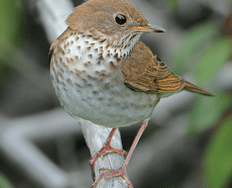 The regulation helps reduce new introductions and the spread of existing invasive populations. For more information on Part 575, visit DEC’s Invasive Species Regulations web page. HWA is a tiny insect from Asia that attacks North American hemlock trees. Damage from the insect has led to widespread hemlock mortality throughout the Appalachian Mountains and the southern Catskills with considerable ecological damage, as well as economic and aesthetic losses. HWA infestations can be most noticeably detected by the small, white, woolly masses produced by the insects attached to the underside of the twig, near the base of the needles. 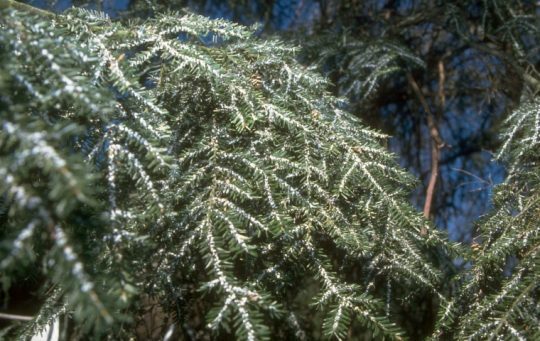 For more information on HWA, including identification, control techniques, and reporting possible infestations, visit DEC’s website or Cornell’s New York State Hemlock Initiative. DEC encourages the public to learn more about how to report unusual forest insects, plants, and diseases by visiting the Forest Health web page and reporting possible infestations to foresthealth@dec.ny.gov. DEC encourages anyone with information on environmental crimes and violations to call its 24-hour hotline, at 1-844-332-3267. Photo of A hemlock woolly adelgid infestation courtesy USDA. invasive species clamor is a bunch of baloney and has been carried entirely too far to the point where even NYSDEC has admitted that they can’t halt the spread of some insects (i.e. Emerald Ash borer ). So what do they do….they “excuse” the loggers from the transportation regulations, yet still prohibit the average person from transporting “firewood”, etc. like that’s going to help in some way. Or…..perhaps it’s just a convenient way to get more revenue from fines levied if you transport firewood more than 50 miles without a permit…..
New York State is so OVER-Regulated that people aren’t just leaving they’re running out of it and no wonder!! Invasive species have an enormous impact on recreation, which is a main driver of our Adirondack economy. Just because DEC has admitted that it is unable to control some invasive species, or has weak regulations in some areas, does not logically lead to the conclusion that DEC is unable to control all invasives, or that it should stop attempting to control all. Right-on, John! Thanks for not letting Tim-Brunswick’s flawed assertions go unaddressed. There’s that Tory way of thinking all over again! Let them run Tim! We don’t need them around anyhow! De-regulation is the same thing as saying, “Have your way with what remains…polluters. “Piss in our waters, pour your mercury in!” Those who support deregulation are ……psychoneurotic! Who benefits from deregulation? The fossil fuel industry for one…the very people who deny global warming, the very people our erected puppet-in-chief are giving the public wealth away to (not that you care about our national parks or endangered species Tim.) Some people! You can disappear a glacier right before their eyes and they’ll still deny the earth is cooking. America the raped…it started with deregulation! Precisely WHAT does this mean? Is the nursery to ship TREES to DEC, or to send copies of all ORDERS made by NY customers, to DEC? The sentence is rather ambiguous. I would hope it means that they have to send copies of customer orders to NYS DEC.